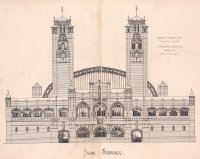 This was Mackintosh's unsuccessful entry in the 1892–3 competition for the Soane Medallion, a student prize awarded annually by the Royal Institute of British Architects. Mackintosh's was the only Gothic design submitted. Authorship: The design was published under Mackintosh's name in February–March 1893.